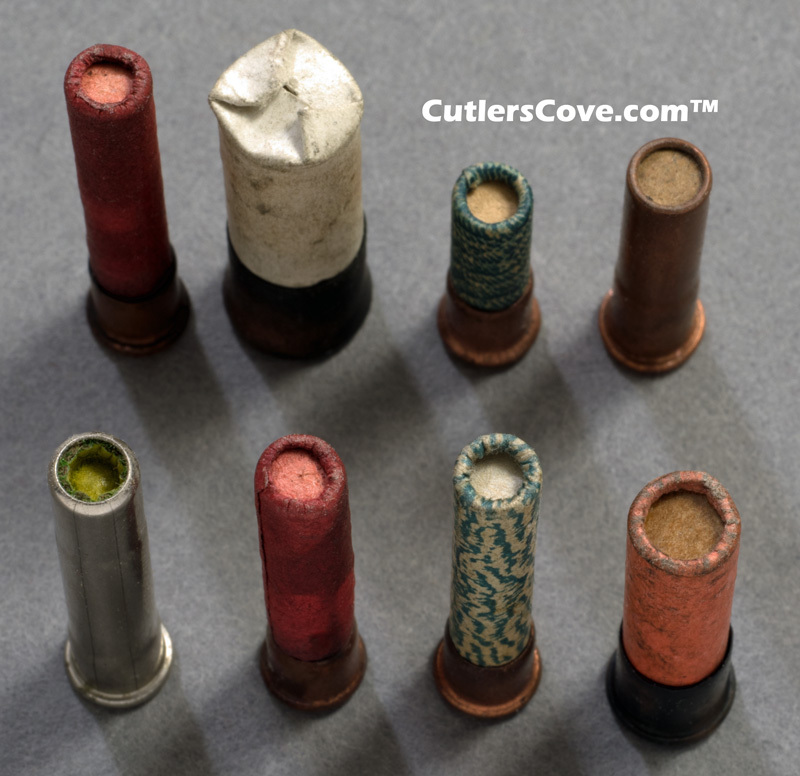 8 vintage 6mm gauge shotgun shells in 6mm gauge most are paper with roll-crimp. Many with high brass. There are two all metal shells. There are Eley, Fiocchi and others. Most were made before 1945. All are in excellent condition or better. All are 6mm gauge except one 7mm and one 9mm gauge. None are common shells. The shells are in the same order in all three 3 photos below. This way you can see the top and bottom of each shell. Each shell is priced based on condition, brand, age and other factors. All measurements are approximate. Flobert \Flo"bert\, n. (Gun.) A small cartridge designed for target shooting; -- sometimes called ball cap. Examples are 9mm and smaller. These are old shells and probably should not be fired in your shotgun. All ammunition is for collecting/decorative purposes only and we in no way guarantee or imply them to be functional in anyway other than collecting or decorative purposes. 1999-2018 Cutler’s Cove Knife Emporium ™ All rights reserved. The descriptions above match the order of the shells above. There is a $15.00 minimum order requirement. 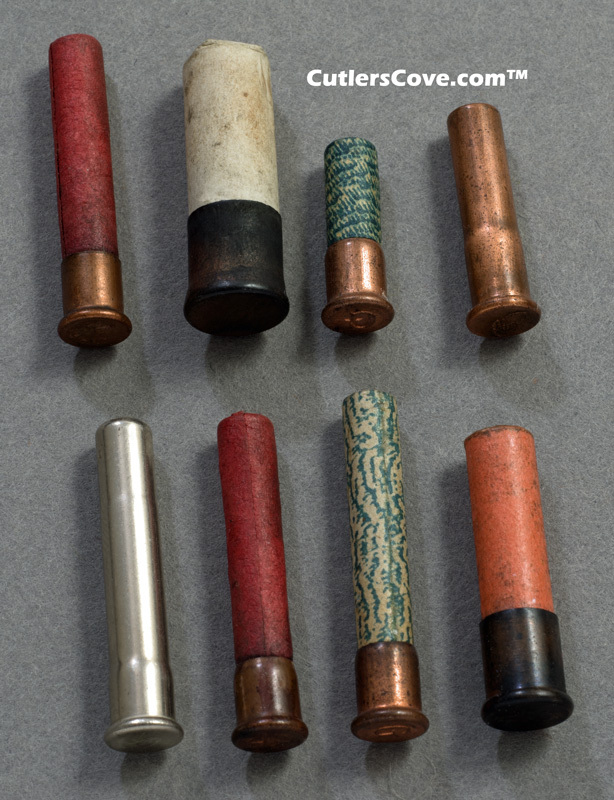 8 vintage 6mm gauge shotshells in 6mm gauge most are paper with roll-crimp. Antique ammunition. Old Ammo. One shot shell only at each price. The shell in the photos above is the one you get. Want to save about two weeks in delivery time on your ammunition and shotshell orders from us? Send us a USPS Money Order! Click small image for larger image. You must be 18 or older to purchase ammunition. Check your local laws for any regulations before ordering any ammunition products. Live shotshells can only be shipped by UPS and they charge a service fee for shipping ammo in addition to their normal shipping charge. Therefore shipping is higher for these shells than our normal shipping charge. Shipping will be via UPS Ground only! A physical address will be necessary as UPS does not deliver to Post Office Boxes. To order call us and will be glad to hold what you want for 5 days to allow you to send us a money order or check. We only sell shotshells with a money order or check because PayPal does not allow ammunition to be purchased through their payment system. Please understand, this is NOT our rule but is PayPal's rule. Other products and companies referred to herein are trademarks or registered trademarks of their respective companies or mark holders. No such use, or the use of any trade names, is intended to convey endorsement or other affiliation.